After spending over a month at Vijay Rathinam’s Audioville studio, Chennai, I’ve learned a lot about what it takes to work in film sound design. Going in I had a vague idea of what to expect,half hoping I would find myself in a mad scientist lab of synthesizers and fancy gear along the likes of Junkie XL or Ben Burtt, instead I found minimalism and efficiency. Vijay runs a studio facility for film post production in sound design, audio editing and foley. He is the head sound designer and audio editor. He has a team of assistants for sound design as well as a separate team to record and edit foley. Despite being substantially staffed I found Vijay handling whole projects completely by himself often working for up to 16 hours at a stretch. This is a necessity since he takes on a variety of projects in multiple languages across different film industries around the globe. He explains that being quick to deliver quality work has been his approach to building such an impressive clientele. To maintain such a work ethic one should truly enjoying what one is doing. Pro Tools maybe the industry standard DAW for post-production but Vijay has moved on to Reaper as his de-facto editing platform even though he delivers his finished work as a Pro Tools session. Reaper offers a level of flexibility that allows him to tailor the DAW to his workflow and not the other way around. He attests that switching to reaper has more than doubled his workflow speed. I learnt that every good sound designer that builds and layers sounds together to bring a movie to life needs a large bank of high quality sound libraries. Such libraries are collected over time form sound library manufacturers as well as one’s own personal recordings. Investing in industry standard libraries and procuring professional sounding real life sounds is a regular habit of Vajy’s. He keeps an inventory of microphone and recorders from inconspicuous ones like the rode iXY or a Zoom H4n to more elaborate rigs with shotgun microphones and multi channel recorders. To manage his sound bank which well over twelve Tera Bytes in size he uses another industry standard software for library management called Sound Miner. This software allows him to filter through his library using special tags and nomenclature. He can then audition sounds back to back until he has a bunch to construct a given soundscape. In the month I spent observing Vijay work I was exposed to a wide variety of work. European projects,cinematic trailers, independent Hollywood films, Tamil language art films and commercial films. If anything Vijay is a prolific and methodical sound designer. 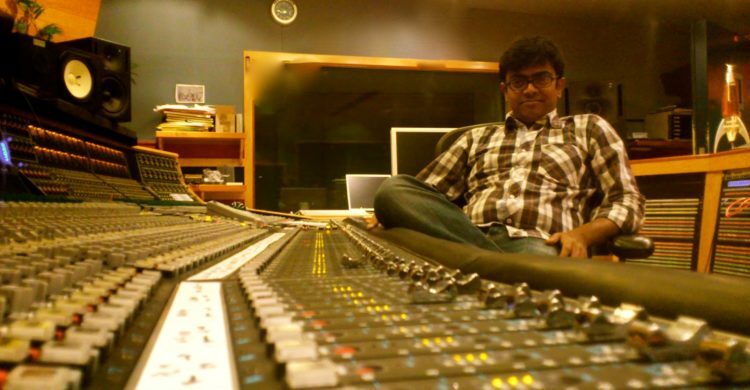 Vijay frequently collaborates with different sound supervisors, dialogue editors and mix engineers. The nature of post-production work is such that changes and revisions happen more often than you realize therefore maintaining a good and professional work relationship with your collaborators is crucial. What I took home was that in order to be successful in post-production in this day and age you need to have a strong work ethic, an unwavering passion and a knack for time management. You must also be willing to learn and think outside the box and stay ahead of the curb experimenting outside the tried and tested path.